"I don't think my Command Base is working. How can I find out?" Check yer base light for flickering with Cab1 commands. It should flicker. If yer base is flickering, and still is not working, check yer ground connection at the wall plug. You need a 3 prong connection for a ground. Make sure yer single wire connection goes to the outside rail. Turn it off and on again (by unplugging it). Try it now. If that isn't it, take yer base to yer dealer's store and try it there. If the base is still not working, call Lionel customer service and they will replace yer base. "Since I've now gone to TMCC on all four of my loops, another problem has come up. When one engine starts moving, it slows the others already moving down considerably from the power drain. My loops are all connected, so is there a way to add power without isolating any one of them? I have a ZW powering it now. I don't see how the new ZW will be an improvement." You need more power for all yer trains. You should separate the loops with insulated track pins and power them separately. The new ZW would be good. Or, so would a few PowerHouses and a few command control lockons. "Having multiple loops all command controlled is new to me. Right now I've got my command base connected to the common U post on the rear of the ZW. If I do that but instead of another transformer use the other side of the ZW, with the U posts being common, will one command base still work or will I need a command base for each isolated loop?" One base per layout. That's it. One wire to the ground. The rest of the ground is carried by the track (lionel tubular). No more wires. No more bases. Good luck and enjoy yer TrainMaster. "Do I prep the new Lionel articulateds for smoke?" The Big Boy is different from the Allegheny in care of the smoke unit. The LIONEL Allegheny directions ask you to put 35 or so drops of smoke fluid in to prime the smoke unit. With the LIONEL Big Boy, the 35 drops were put in at the factory. The Big Boy smoke unit arrives already primed. If you initially add 35 drops of smoke to yer BIG BOY like you did on the Allegheny, yer smoke unit will be flooded. This info comes from our sources at LIONEL customer service. To remedy this situation, Turn it upside down and drain any excess out, then use a hair dryer and Q-tips to dry and clean up. Everything should work fine after that on this beautiiful LIONEL articulated! "I have set up my New ZW with four 135 watt powerhouses, I have everything wired properly all U (common) connection are to the outside railing. I have checked and double check BUT!, when I powered up, no power from the transformer on the two outer banks? If I disconnect the command base, it powers up and works the trains in conventional mode fine." With the Cammand Base connected, the PWC ZW is in command mode which means you need to press TR-1 and throttle up the power to the A post, and TR-4 and then power up the D post. B & C put power to the track acording to where the handles are. With A & D you have to move the handles to the highest power you will want to get and then address them as TR 1 & 4 and increase the track voltage from the Cab1. For example, you can use B & C for TMCC engines & A & D for conventional. Just received the Lionel catalog and I had my first chance to look closely and read all the details on the Allegheny. As posted before, the C&O is missing the white stripe but according to Lionel, this will be corrected on the real model engine. But here is a suggestion to Lionel that will enhance the engine even more. Why not put an operating coupler on the front or at least have the opition to install a front coupler. For those that can afford two engines or at a club with two members owning one each, they can be double headed. Other applications is to use one engine as a pusher or use the Allegheny to push a snow plow. Whatever the application of the front coupler, it lends itself to more enjoyment of by the operator. More enjoyment, more applications all lead to more sales. "That would be a great idea to put a front coupler on the Allegheny. They should put a front coupler on all the steamers. The only steamer's that have them is the switchers. Well wait the Mohawk has one but I don't know that you can use it as its too small. Oh wait a second here. I think one of those scale couplers came with the C&O Hudson. Gotta go downstairs and check this out." I`ve been buying these couplers a lot lately and they work vary nicely. Ah checked it out it kinda works. 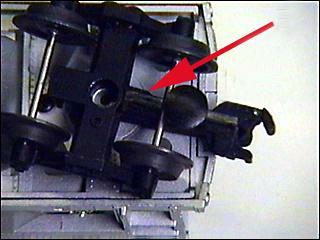 Put the scale coupler on the tender of the C&O Hudson. Hooked it up to the new Mohawk it works perty good. Probably would be better if I had all 072 curves. I've got some 054 and maybe a few o42 curves. They have a hard time making it through those curves. Man gotta get all 072's in there some how. Anyway it makes for one hell of a train with those 2 big engines going down the track the sounds and the whistles going at the same time. Gotta change that track. The common problem these seem to have when they have this symptom is the pickup rollers are not extending down all the way and skipping at times causing an arc which in turn causes a DC spike. The TMCC boards do not like that and do some strange things, one of the most common is firing the coupler (either one or both). Out of 7 sets of GP`s that had a problem, this fixed the problem and one other needed a capacitor soldered between the two power supply wires going to the board (same cap used on the motor leads). Most of the TMCC boards never have a problem and if I didn`t get so many people wanting help off the net I probably wouldn`t run into a lot of these problems. "Can I fix couplers myself without removing the trucks?" LIONEL diecast sprung trucks come from the factory looking fine but sometimes operation can be inconsistent. To fix this situation, locate all of the faulty couplers and place those cars on a flat area. It is not necessary to remove the truck from the car. 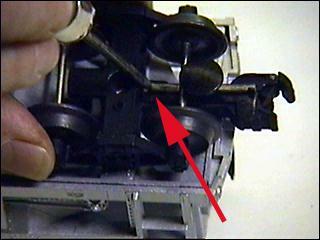 Located on the underside of the truck, there is a plastic leg with a tab on it running the length of the coupler shaft. There is a connection to the diecast truck shaft that you can't see. If this connection is incomplete, operation will be inconsistent at best. In most cases this is the root cause of the problem. To fix this problem without taking the truck off the car, just press with a little screwdriver at the point indicated in the picture below. The arrow points to the plastic arm that you need to apply the pressure to. Gently but firmly apply pressure directly down on the plastic arm where the arrow is pointing until you feel it "seat" into the correct position. You will feel it gently snap into place. Now yer coupler should work fine. Note: Coupler sets shipped starting in 12/01 (6-14078) include a tension screw and spring that address this problem. "Do I really need 18 volts to run TMCC?" Absolutely not! In fact, you can run TMCC at any voltage you like. Running at lower voltages actually increases yer low speed control, while it does decrease yer top speed. The pulses of power still come through yer LCRU to yer loco's motor, but at say 15 volts yer gonna get more fine control at slow speeds. That's a good reason to keep and use an old ZW for yer power source, especially in the YARD! "Why do I have to turn my throttle so many times to get my train moving?" You shouldn't have to. First, press (L) at the bottom of yer Cab1 because you may have a high (H) or medium (M) momentum setting stored in yer engine's memory. (L) or low momentum gives you quick throttle response. If that doesn't work, try setting the stall voltage on yer loco. (see yer directions). Finally and most importantly replace yer batteries. Now try it. OK, suppose none of those ideas made a difference. Go over to yer command base and watch the flickering light as you rotate yer throttle. If the light stops flickering while you are rotating yer throttle, and you have changed yer batteries, you have a defective throttle with "dead spots". Return it to LIONEL (810 949 4100, ask Irene to connect you to customer service). LIONEL should replace yer throttle free of charge. Some early rotary throttles from the first issues of CAB1 are defective. They do not perform up to specs. Yer throttle should rotate freely through 360 degrees and have no "dead spots". Although we do not expect a problem, let CCA know if you do have a problem getting yer defective throttle replaced. "What about tracks running through wire mesh tunnels and mountains? Does the mesh interrupt the TrainMaster signal?" In rare cases, this can happen. The solution is simple. Run a wire from the mesh to earth ground. That will take care of it. If yer wondering what the heck is "earth ground," its the third prong on yer three prong plug that fits into yer wall outlet. "I would like for TMCC to have a one button master reset for resetting the engine. So when and if it gets out of whack, you do not have to look it up and go through a sequence of numbers. Also some preprogrammed button to do more difficult things like setting lash ups." There is only one way you would need the factory master reset procedure. That is, if you were programming an engine ID#, and after you entered it, you forgot to put yer engine's "program/run" switch back in the "run" position. If you forget to do that, go on operating yer engine, and then hit aux1 and any numeric command, you would have possibly reset yer engine to another type of engine, like making yer steamer into a diesel or something like that. Always be careful to put the switch back in the "run" position immediately after giving yer engine a new ID#. Most folks set a new engine ID# that is part of the road number on the side of the engine. (i.e., a Santa Fe 2343 would be EN# 23, 43, 34,or 2.) It is a one time only procedure. Just remember to put yer engine's "program/run" switch back in the "run" position after entering a new Engine ID#. The factory reset procedure is available from LIONEL customer service, should you need it for older TrainMaster equipped engines. The new engines have the procedure included in the instructions. With regards to a simple button fer setting lashups, there are rumours that a new command control ZW, in development at LIONEL, will take care of that in a way that is fun and easy. "Hello! I was wondering that in your experience with the TMCC system, have you ever tried to work it with an automatic block system? Here is what I think is a problem. If a train is in block A and another train is approaching from the rear (block B), how do I slow it or stop it while the train still occupies block A? Assume both engines are CC locomotives. I am new to this and I was hoping for a way to let a block system control one engine while I used the CAB-1 to manipulate the other one. Any ideas?" Good question! For the time being, you could use a block system to reduce the voltage on the amber or red track to about 3 or 4 volts. That would stop yer train and have it retain its speed setting onboard. In the future there will be a way to send automatic commands to yer engine from the base when yer engine enters an amber or red block. The engine would apply its brakes, come to a stop and wait for a signal change. Then it would blow its horn and start up again when the signal changed. "I got a Torpedo for Christmas, and it's front wheels derail whenever it goes through my Lionel switches. My Virginian diesel has a real hard time also. What's the deal?" Sometimes the front wheels of the Torpedo get turned around. Check and see if this is the case. Yer Virginian should have no problem with switches so I suspect yer switches have a problem. Either take them back to the dealer where you got them or call LIONEL at 810-949-4100 and ask for customer service. They will give you a return auth # over the phone and/or fax you a document to fill out and return with the switches. Unfortunately, some of the recent switches have problems but if you tell customer service they should replace or fix them. Let me know if you have trouble getting this accomplished and I will follow up for you. "Every time I have any kind of derailment, the circuit breaker blows on my Powerhouse. I also find it really odd to have to get up and walk over to my powerstrip to shut down my Powerhouse." You are using a Powermaster with yer Powerhouse right? It should trip its breaker before the POWERHOUSE. I am sure you have a defective Powermaster which should be replaced free of charge. Again Call customer service. Sorry about yer problems. Let me know if you have trouble getting customer service to take care of yer Powermaster. Best of luck, we should be able to solve yer problems easily. If you have trouble, get back to me.